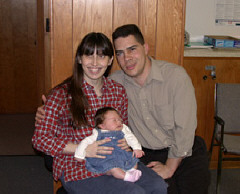 Maria Morais and Eddy Bell, both NFB scholarship winners and Federation leaders wherever they go, have notified us that on March 9, 2002, at 1:25 a.m., they welcomed Victoria Morais Bell into the world. She weighed six pounds, five ounces and was eighteen and a half inches long. Congratulations to the entire family. This spring we went to Circus Circus in Las Vegas for Business, Leadership, and Superior Training, a conference that included all these elements and exceeded all expectations--record-breaking attendance (142); record-setting enthusiasm; new partnerships; an exclusive state licensing agency networking round table; superior training in customer service, interviewing, and hiring employees; and managing change in a new business climate. The National Association of Blind Merchants Spring Conference was all that and a bag of chips. Yes, you could check out the latest in snacks, food, and other business products at the National Buyers Group Trade Show. James Gashel, Director of Governmental Affairs for the National Federation of the Blind, spoke of the many challenges ahead for the Randolph-Sheppard Program and called on our Federation merchants to stand up and meet those challenges as we have in the past. We heard a luncheon address from Joanne Wilson, the Commissioner of the Rehabilitation Services Administration. She spoke of the need for this country's blind vendors to work in greater harmony with vocational rehabilitation agencies who work hard to support Randolph-Sheppard. Commissioner Wilson talked about the application of the Randolph-Sheppard Act to increase opportunities for blind entrepreneurs in military dining contracting and in other concessions on federal properties such as national parks. She addressed the need for all of us to acquire the necessary training, not only in business, but also in the skills of blindness to increase our confidence and therefore operate our businesses more effectively. Following Commissioner Wilson's inspiring words, we presented her a trophy with a gold star on top in recognition of her leadership and understanding. All in all the consensus was that the National Association of Blind Merchants Spring Conference was a Blast. For sale, standard Perkins Brailler in good condition. Asking $400. Call (831) 372‑4131 or e-mail <aharris@redshift.com>. 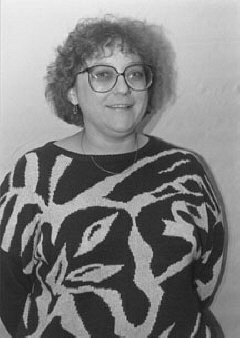 On February 22, 2002, Sally Jacobsen, the first lady of the NFB of New York, passed away following a long illness. For many years Sally was an active member of the affiliate, quietly lending her support and encouragement to everyone. She played a vital role in helping her husband Carl continue building and strengthening the affiliate. She will be very much missed by all who knew her. The entire Federation family joins the New York affiliate in extending our sympathy to Carl and the Jacobsen children in their loss. Braillewriter Cleaning and Repair Service has been in operation since January of 1998. The owner, Bernadette Dressell, was trained and certified by Howe Press in Watertown, Massachusetts, where Perkins Braillers are manufactured. In addition to using the most up-to-date equipment and cleaning solvents, Braillewriter Cleaning and Repair Service has a large inventory of parts. Under normal conditions we clean, adjust, and lubricate manual Perkins Braillers in two weeks or less at a cost of $65 plus shipping and handling. Contact us about servicing your manual Perkins Braillewriters at 2714 Ruberg Avenue, Cincinnati, Ohio 45211-8118, (513) 481-7662, e-mail <pmd@pobox.com>. In November, 2001, the NFB of New York held its statewide election. The new officers are Carl Jacobsen, President; Marie Kouthoofd, First Vice President; Craig Hedgecock, Second Vice President; Julie Phillipson, Secretary; and Ray Wayne, Treasurer. Do you need to transcribe print material into Braille for the benefit of those that you serve or teach? We offer transcriptions into Braille at very modest prices for all kinds of documents, including agendas, brochures, labels, legal documents, letters, lists, manuals, maps, menus, and more. Just let us know your needs, and we will tell you if we can do it. Contact Priscila Ayala at Translations at Your Service, phone/fax (404) 363-1731 or e-mail <Abiriam@aol.com>. The National Blindness Professional Certification Board announces that an orientation and mobility conference will be held in Louisville, Kentucky, at the annual National Federation of the Blind convention. The conference, the National Federation of the Blind Orientation and Mobility Conference: Serving the Blind Through Structured-Discovery Instruction and Performance-Based Certification, will be held on Wednesday evening, July 3, from 7:30 to 10:30 P.M. The conference will be of particular interest to those currently holding National Orientation and Mobility Certification (NOMC), travel teachers interested in learning more about this alternative non-discriminatory, performance-based certification process, those interested in earning credit to meet continuing-education requirements, those interested in travel training as a career, and those with general interest in cane travel for the blind. Conference Co-Chairpersons are Christine Brown, NOMC, and Edward Bell, NOMC, graduates of the O and M master's program offered through Louisiana Tech University, Ruston, Louisiana. Christine Brown is employed in the Disabled Students Office at the University of Michigan, and Edward Bell is pursuing a doctorate at the University of Arkansas. NOMC certification is available to O and M instructors who graduate from approved university programs. In addition, however, many outstanding travel teachers in the country, though agency-trained, do not hold university O and M degrees and thus have historically not been eligible for professional certification. NOMC certification is also open to these instructors upon successful completion of the performance-based examination if they have a minimum of two years teaching experience. For more information about the conference contact Christine Brown at (734) 944-7446, e-mail <cbrown1472@aol.com> or Edward Bell at (501) 521-0788, e-mail <ebell@uark.edu>. If you are interested in teaching travel for the blind as a career, in non-discriminatory alternative certification, or in both, please join us. When you arrive at the convention, consult your Preconvention Agenda for the location of the Wednesday night conference. 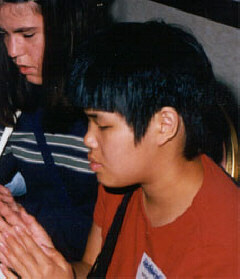 The Communicating Computers for the Blind Foundation, Inc., is a non-profit foundation established to provide free computers, software, and training to blind people with no useable sight living in the United States. The Foundation seeks to enhance the quality of life for the blind through the technology of personal computers. Through communication technology we introduce the blind to the new and exciting world of the Internet. New adventures and experiences await those who are trained in e-mail, word processing, electronic books, online shopping, online newspapers, digital radio, information searches, and much more. All training and living expenses are free and cover a two-week period at the Foundation facilities in South Dakota. When training is completed, the free personal computer used by the student is shipped at no charge by the Foundation to the student's home. Students will be responsible for their own transportation to South Dakota and for their screen-reading software, Connect Outloud, which costs $249. Students must also be able to type. If this sounds interesting to you, call (605) 644-0445. At its January, 2002, meeting, the Austin Chapter of the NFB of Texas elected new officers. They are Margaret "Cokie" Craig, President; Jeff Pearcy, First Vice President; Angela Wolf, Second Vice President; Norma Gonzales Baker, Secretary; Jim Shaffer, Treasurer; and Brandy Wojcik and Diane Yoder, Board Members. I have for sale a Perkins Brailler in good condition, asking $75. For further information contact R. J. Galla at (203) 744-4490. The Princeton Braillists have released their newest publication, Atlas of Central and South Asia. This is a set of tactile maps covering thirteen countries and the disputed territory of Kashmir. Overall maps as well as individual maps of each country are included. The maps have considerable detail, and some experience with tactile maps is recommended. The countries included are the five central Asian Republics of Kazakhstan, Turkmenistan, Uzbekistan, Tajikistan, and Kyrgyzstan as well as Afghanistan, Pakistan, India, Bangladesh, Nepal, Bhutan, Sri Lanka, and the Maldives. Each country has an introductory page of facts followed by a key and full-page map of that country showing physical features, cities, and towns of both political and historic importance. Additional maps for India show states and territories and an enlargement of the Andaman Islands. Atlas of Central and South Asia contains nineteen maps, seventy-two pages total. It is bound with cardboard covers and a multi-ring binder. The cost is $16, and shipping is free, unless other arrangements are made. Other items available include Basic Human Anatomy, Atlas of North and South America, Maps of the British Isles, Atlas of Western Europe, and Atlas of Eastern Europe. Please send check or purchase order to the Princeton Braillists at their new address: 76 Leabrook Lane, Princeton, New Jersey 08540, (609) 924-5207. The Association of Blind Citizens (ABC) has established the Assistive Technology Fund, which will provide funds to cover 50 percent of the retail price of adaptive devices or software. The ABC board of directors believes that this program will allow blind and visually impaired individuals access to technology products that will improve employment opportunities, increase the level of independence, and enhance the overall quality of life. The products covered by this program must retail for a minimum of $200 and a maximum of $6,000. Those eligible to apply for assistance must have a family income of less than $50,000 and cash assets of less than $20,000. Applications will be reviewed by the Assistive Technology Committee, and recommendations will be submitted for board approval. If applicants are selected to receive a technology grant, they will be asked to provide documents such as tax returns, bank statements, and any other documents that the ABC board or its designee deems necessary to assess financial need for the grant. Applicants must be legally blind, and the grantee must be a resident of the United States. Applications must be submitted by June 30, September 30, and December 31 for each grant period (three per year). Applicants will be notified if their request for a grant is approved. Applicants may submit one request per calendar year. All applications must be submitted via e‑mail in accordance with the procedures outlined on the ABC Web site. You will be notified by ABC within forty-five days of the application deadline. To learn more and obtain your application, visit <www.assocofblindcitizens.org> and click on the Assistive Technology Fund link. I am starting a cassette tape support group for the blind and disabled dealing with mental health issues such as depression, anxiety, panic disorders, shyness or social anxiety, and sexual abuse. Do you suffer with never-ending depression? Do you feel anxious and nervous about certain situations such as going out alone or being in crowds? Do you feel inhibited in talking with other people due to shyness? Have you experienced sexual harassment or abuse by family members or someone else in your life? Do you feel alone in dealing with your problems? We will be here to support each other and share our experiences with each other and learn and grow together. Group members will submit their discussion on cassette tape, and it will be compiled into an interactive group cassette, which is sent out each month. I will provide self-help materials on each tape to help us all learn to overcome and deal with our issues of depression, anxiety, shyness, and other topics discussed. In order to join the group you must sign a confidentiality form, stating you will not divulge names or any other information shared in the group. Dues to join are $12 a year, $1 a month. If members join during the year, the dues will be prorated. For more information or to become a member, contact us by cassette tape, Braille, floppy disk, or e‑mail (no hand-written letters please) at Mental Health Issues Support Group, 610 B Avenue, Vinton, Iowa 52349, e‑mail: <bev@prairieinet.net>, <listserv@Braille.org>. The Kanawha Valley Chapter of the NFB of West Virginia elected Roland Payne, President; Eddie Greenleaf, Vice President; Barbara Smith, Secretary; and Barbara Olive, Treasurer. Friday, July 5, 2002, 7:00 - 9:00 p.m.
A growing number of affiliates and chapters are conducting special events to raise funds and to raise the profile of our organization. This seminar will provide an opportunity to learn from each other how to plan and conduct successful events. Everything from walk-a-thons to black-tie galas will be discussed. Interested participants who are working on events will then be added to a growing e-mail network of NFB members from around the country who can share dos and don'ts of event management. Wednesday, July 3, 2002, 1:00 - 3:00 p.m. This is a seminar on how local affiliates can work with the National Center to identify and solicit area foundations that will help with both local and national projects. Writing the proposal is not the problem; getting to know the funders is the real challenge. Learn how Internet research tools can help narrow the search and how we can efficiently reach out to foundations interested in funding what we want to do. Wednesday, July 3, 2002, 3:30 - 5:00 p.m.
At this seminar attendees will hear from parents, teachers, and NFB leaders on how they have promoted the use of the Braille Is Beautiful curriculum in public and private schools and among civic clubs and other organizations. Learn how we can get the word out on how effectively this program introduces sighted kids and adults to the Braille reading and writing system and, in so doing, educates about the capabilities of the blind. Do you feel the need to exercise?� Do you have a spirit of adventure?� Erik Weihenmayer, NFB member and the first blind person to summit Mount Everest, will be hosting a rock-climbing exercise at the Galt House.� We welcome young and old for some fun in fitness. With the cooperation of a rock-climbing organization in Louisville we have arranged to have a 20-foot rock-climbing wall available to us at convention.� Consult your convention agenda for exact details and more information. Benetech, the nonprofit successor to Arkenstone, is pleased to announce the launch of Bookshare.org. In the November 2001 issue of the Braille Monitor you read about this new legal way to distribute copyrighted books using the Internet. Now a book scanned by one person may be shared with blind people throughout the country. Please take a look at our Web site by going to <http://www.bookshare.org>. More important, be sure to visit us in Louisville at the 2002 Convention of the National Federation of the Blind. We will be in the exhibit hall demonstrating Bookshare.org and answering your questions. If you need any information before the convention, you may write to us at <Info@bookshare.org>. See you in Louisville. I recently received the following letter. It reminded me all over again how important is our work with blind kids. I recently received the March issue of The Braille Monitor. Reading about convention and the various articles contained in the issue caused me to reflect upon our family's personal history with the Federation, and I wanted to express my gratitude. Though I personally have appreciated my contacts with the parents' division and their continued help and Kathryn's opportunity to meet blind children and teens, it is our personal relationship with blind adults in our Idaho affiliate and the national organization that has caused significant changes in my daughter Kathryn's life and that has provided support for over eleven years. We first met Ramona Walhof shortly after we moved to Idaho. I do not even remember what problem brought me to her door. (I do remember her expecting Kathryn to be able to do typical four-year-old tasks.) Ramona introduced Kathryn and me to other Federationists, and, though I have not been personally involved in our local chapter, the chapter has included Kathryn in many of its activities. They have also spoken to her countless times on the phone. They have, in other words, developed relationships with her as a Federationist, independent of me. And it has been a true blessing. I have appreciated the wonderful role models Kathryn knows here in Idaho and has observed at National Convention. Because of these relationships with blind adults, Kathryn sees herself as a working person, a mother, a friend, a traveler, and most important a person of worth. I attribute that to her knowing many blind individuals who are all of those things and more. My husband died February 2, after having pancreatic cancer for over a year. During that time I came to doubly appreciate the local and national community of the blind. Kathryn was fortunate to have a support system of caring adults (Federationists) to whom she could turn. Often those within our family were exhausted and dealing with our own emotions. We were grateful that she had established relationships with mature, caring adults to whom she could turn. And in turn she learned another lesson from her role models: friends offer support and comfort to others. And I have noticed a change in her willingness to listen to others' problems. What a gift. So thank you, NFB, for being Kathryn's village. Have you made your campaign pledge yet? Please take this opportunity to complete your pledge form. Without you our job will be just that much harder. ___ My employer will match my gift. __ I (We) wish to remain anonymous.